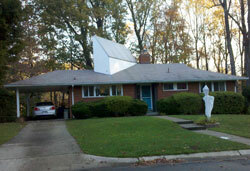 This installation negatively impacts the character of this mid-twentieth century house and does not meet the Standards. Solar panels installed on a historic property in a location that cannot be seen from the ground will generally meet the Secretary of the Interior’s Standards for Rehabilitation. Conversely, an installation that negatively impacts the historic character of a property will not meet the Standards. But what about the grey area between out–of–sight and obviously obtrusive installations? 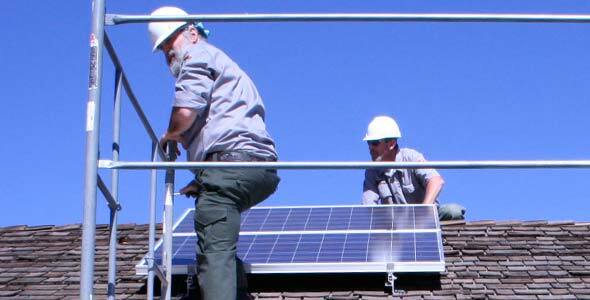 Although every project is different and must be evaluated on its own merit, the National Park Service has developed this guidance on how to apply the Standards to the installation of solar panels. This "invisible" installation of solar panels on a historic industrial building—hidden behind a low parapet—meets the Standards for Rehabilitation.